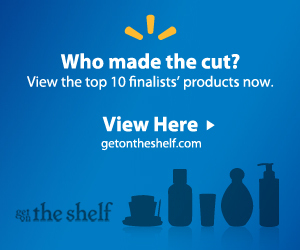 CONGRATULATIONS GET ON THE SHELF FINALISTS!!! Back in January, we announced a nationwide contest called Get on the Shelf. Get on the Shelf allows anyone the chance to get their product on Walmart shelves. We have been inspired and amazed at the products entries from around the country. Over 4,000 contestants participated with products ranging from household and food items to wellness and green ones. Every product, from the fork designed specifically for a dog, to the gadget that turns an ordinary water bottle into a baby milk bottle, reflected the creativity and passion of our contestants. - Bios Clinical Acne System is an acne system that uses topical probiotics to treat adolescent and adult acne. - Humankind Water gives 100 percent of its net profits to provide clean drinking water for some of the one billion people in this world dying without it. - Mr. Spritz Mysterious Shirts are entertaining t-shirts containing hidden images that appear when the garment gets wet and disappear when dry. - Plate Topper transforms dinner plates into airtight food storage containers to save meals, leftovers and snacks. They are dishwasher-safe, microwave-safe and 100 percent BPA-free. - Sola-Bag Forever Carry Refrigerator is a lunch bag that stays cold forever by generating energy from solar power and indoor lighting. - Soleeze Spring Loaded Insoles are spring-loaded insoles and shock absorbers that fit into any shoe or boot and last for years. - SnapIt Eyeglass Repair Kit is an easy way to fix your sunglasses or eyeglasses in 30 seconds. - SUSIE Magazine is a bimonthly Christian print magazine and online sisterhood for teen girls promoting healthy relationships, good role models and positive self-image. - Veterans Farm Datil Pepper Salt is a datil-infused kosher salt created at a Veterans Farm, where disabled combat veterans are taught farm skills to help them overcome physical and mental barriers and get jobs. - We the People Bracelet features silver sterling beads with ingrained detailed descriptions of the Amendments to the Bill of Rights. Thank you to all for your participation. We hope you have enjoyed the experience and made new connections along the way. The final round of voting for the contest begins April 11. Please cast a vote for your favorite via text message or Facebook. Let's have a fun race…and may the journey be the best reward of all.